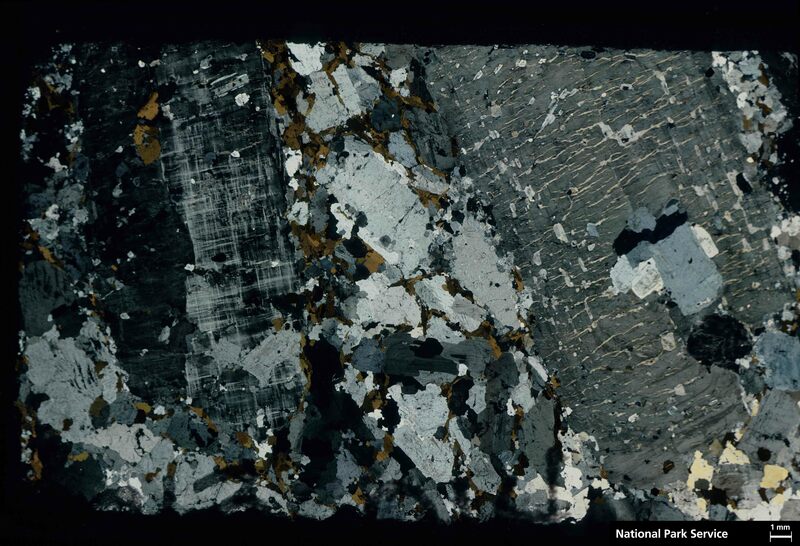 This sample is a plutonic rock dominated by mostly feldspar, including pegmatic crystals, and a lesser amount of quartz. The crystalline structure is very coarse and clearly phaneritic. Maximum crystal dimension exceeds slide dimension of 25 mm (feldspar); minimum is .1 mm (quartz). Quartz grains are notably smaller on average than feldspar grains. Modal grain size for feldspar excluding pegmatic component is about 3 mm and for quartz .75 to 1.5 mm. There are a variety of feldspar twinning patterns including albite, tartan (microcline), and Carlsbad. In one case a pegmatic crystal displays a complex combination of Carlsbad and tartan twinning. Grain boundaries range from smooth curving to substantially consertal sutured; the latter predominates. 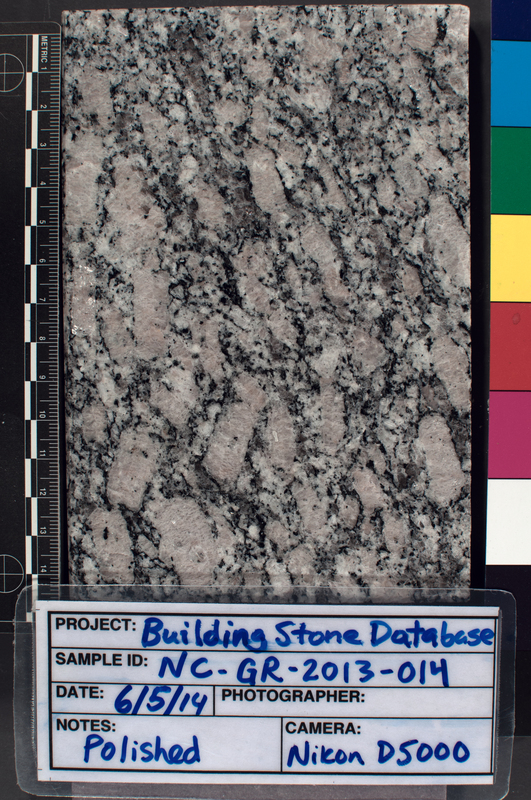 Intergrowth textures include microperthitic involving multiple species of feldspar as well as exsolution texture in feldspar/quartz combinations. Granophyric textures are also present but rare. Zoning in feldspars is common. Accessory minerals include biotite, which is common but less than 5 percent of slide area. Sphene is also readily identifiable in characteristic euhedral diamond shaped crystals. Opaques are quite rare and comprise at most 1 to 2 percent of slide area. There are slight signs of insipient weathering of feldspars with many grains presenting a dusty look. 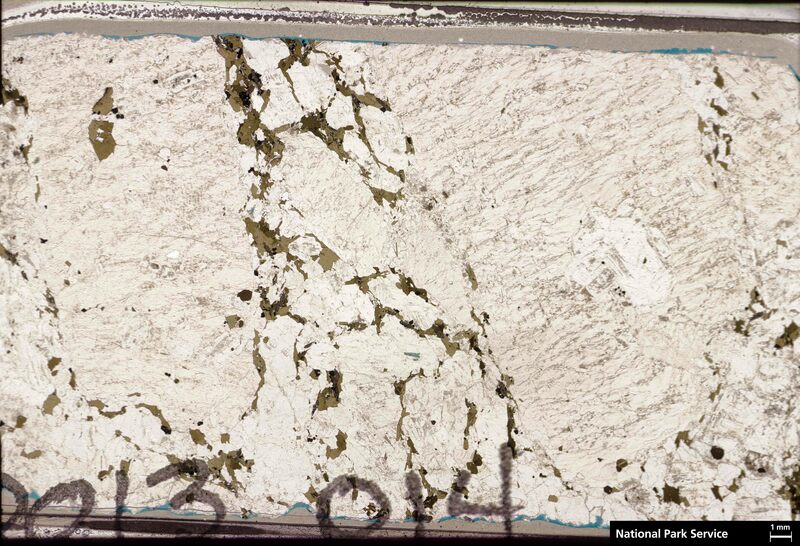 What is likely sericite is present in small patches (~10 µm) on some feldspar grains.